Bazaar Holidays are hot. Notice that I did not say “bizarre” holidays but of course that may apply also. Bizarre in this case would refer to holidays with a twist; something different and unusual or even outlandish. “Bazaar” on the other hand, refers to shopping and, when travel professionals speak with their clients about the wherefore and why they want to travel, this becomes either blatantly obvious (i.e. a trip to the Hong Kong (or Bangkok or Kuala Lumpur) Shopping Festivals; trips to New York City or other fashion capitals), or it is something that is hardly even mentioned. But with some travellers, the prospect of bringing home that perfect souvenir or something for their collection or finding a valuable antique at a flea market, can really be the hidden motivation behind their reason to travel. There is a wonderful word used in one of the many languages spoken in New Guinea. “Mokita” pins it down perfectly. It means “The truth that everyone knows, but no one will speak about”. Immediately our minds flash to situations that fit this description in politics, in the gossip columns and perhaps in our own circle of family or friends. But as far as traveller motivation goes, “mokita’ describes that hidden compulsion to spend weeks planning, days packing, hours flying, days and nights in hotels, and then to come home with much more than just the photos you took. Often times travel counsellors talk about niche markets—themed travel, based on specific shared interests, such as golf vacations or spa holidays, or antiquing or culinary travel. Bazaar holidays takes it to the next level. Certainly the niche may be ‘spending money’ or ‘shopping’ but the bottom line is that perfect ‘something’ to bring back home. Without masking my own interests, I will admit that I collect masks. In Cape Town I was in mask heaven, as the entire city is one big mask market. We must have visited, and re-visited over 50 places during our short stay as I carefully studied the details of each masks, the colour, the weight, the symbolism, and then either made a purchase to complement the many African masks I purchased in Kenya years before, or moved on. In Antigua, Guatemala I visited Nim Pot, an amazing craft store in the historic area, and could not pull myself away from the ‘wall of masks’ at the back of the store. In Chichicastenago, at the Sunday market, I could not believe the colour and variety of masks on display. Six hours and twelve masks later, I had to be dragged from the market. In Bangkok, the place to be is the weekend market at Chaduchak, and in Chiang Mai to the north, there are several stores on the main street that specialize in masks and statues. Indonesia is another gold mine for mask collectors, and particularly in Bali where you can visit the mask makers in their homes and workshops and come away with some wonderful treasures. And this goes on and on…in Sri Lanka, Cuba, Japan, Burma, Malaysia, the Philippines, Mexico and more. The lesson in all this is to probe your clients for the information that they may not volunteer but information that may make or break their holiday. Add questions such as “do you love to shop?”, “what do you collect?” “what kind of things did you buy on previous holidays?”, and in the spirit of CRM (Customer Relationship Management), spend time to see if there are any events or exhibitions or festivals that might complement your client’s bazaar habits. 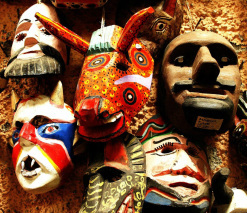 Masks of course are only one example of a bazaar motivation to travel. One friend collects running shoes (sneakers) and with over 150 pairs ranging in price from $4.00 to $350.00, no trip would be complete without purchasing at least 2 new pairs. Another friend collects vinyl records and has upwards of 10,000. Some people collect souvenir spoons, or items associated with the Royal family or figurines. The possibilities are endless. Now of course practitioners of bazaar travel don’t ‘only’ travel for the shopping but it sure adds an exciting adrenalin rush and can influence the choice of destination as well as influence repeat trips to the same destination. Your travel client’s ‘mokita’ is their hidden agenda; their motivation. Your task, should you decide to accept is not a mission impossible. It is to uncover this motivation and then, in true travel professional spirit, take that information and exceed the client’s expectations. This is something that only a travel professional can do.